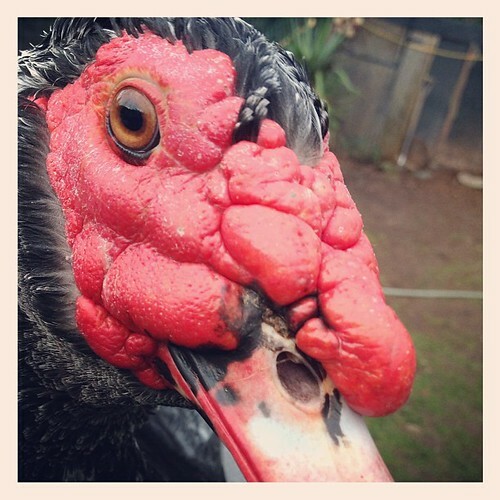 Sometimes when people see muscovy ducks they say “Eeww! Ugly!” Then I usually say “Look who’s talking. You’re one to judge!” in response, but that doesn’t make me many friends. 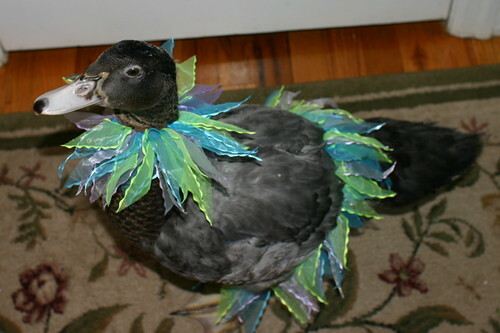 As I’ve mentioned before, muscovy ducks are the only ducks not descended from mallards. They’re not that closely related to other ducks, and don’t speak the same language. They don’t quack, but girls make a trill sound and boys make a huff huff sound. They’re pretty quiet compared to other ducks. 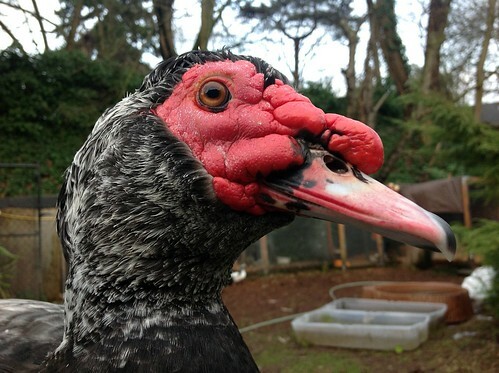 Muscovies are originally a South American tree-perching duck. But now there are large feral populations in the United States. They’ve also been domesticated for meat and eggs, but not at our house… we only rescue here. 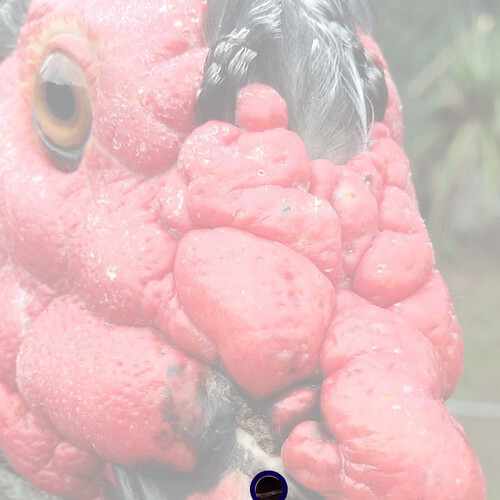 It’s true, the muscovy can be an odd duck when you first see one. But once you know all about them, they’re really quite beautiful. This is my boy O’Malley. He was rescued as a days-old baby over 7-years-ago. He volunteered to help me teach everyone about caruncles today. 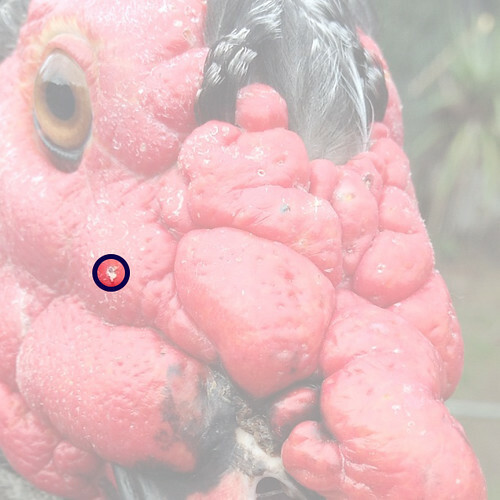 The caruncles are the red fleshy parts around the face on muscovy ducks. They’re also called a face mask. Caruncles help muscovies keep their feathers clean when they dabble in mud. They grow in as muscovy ducks grow up, and they keep growing a little bit for years afterwards. 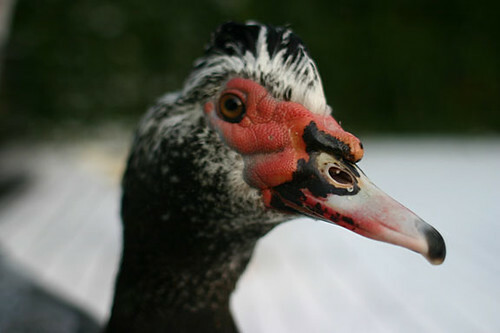 Caruncles also form if a duck fights with another duck and irritates the skin. You’ll sometimes also see female muscovies with caruncles on the back of their heads, where male muscovies have grabbed them for mating. Here is O’Malley at only 14-weeks-old. You can see his caruncles were just barely starting to form. He had whitish baby feathers on his face before that. And here he is at 22-weeks-old. 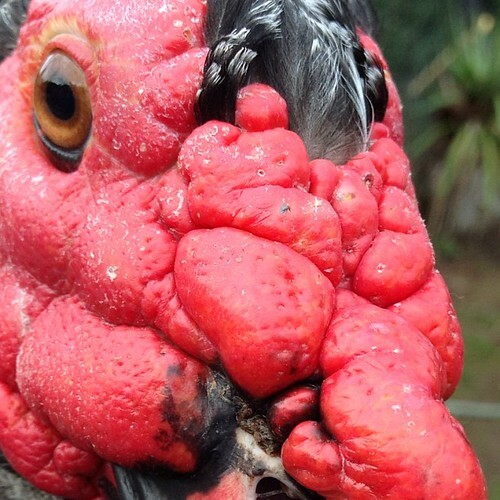 His caruncles were pretty well formed by then, and had replaced most of his face feathers. Now let’s take a closer look at O’Malley’s caruncles today. He is over 7-years-old, so his caruncles are pretty big. This spot on his caruncle is an oil gland. It crusts over like this with a little bit of oil, closing it off. Then when he takes a bath, the crust washes off and the oil starts flowing right out of his face, a tiny drop at a time. As he dries and preens his feathers after a bath, he brushes his face back against his back and wing feathers, oiling them so they stay dry when he’s in the water. These two spots show where new feathers are growing in. They mostly grow on top of his head, but a few of them grow right into the caruncle like this. 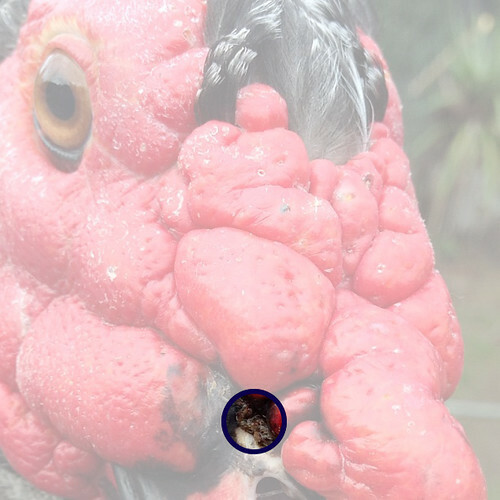 The holes in his beak are called nares. They’re breathing holes just like our own nostrils on our people snouts. This here is some mud and gunk that got stuck under O’Malley’s nubbin. I picked it out of his caruncle for him. Muscovy ducks and other ducks have a nictitating membrane, or second eyelid. Cats have one too. Duck eyelids close from the bottom up as much as the top down, but the inside eyelid or nictitating membrane closes from the front to back. 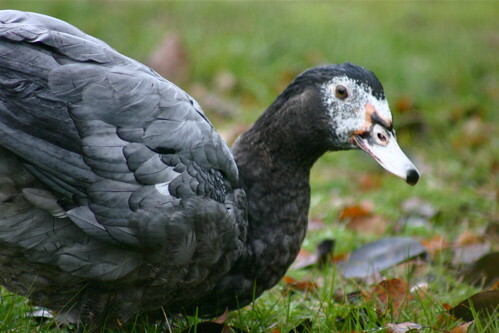 Unlike cats, the nictitating membrane on ducks is see-through. They close the membrane when they swim sometimes so their eyes stay protected while they forage for bugs and food on the bottom of a pond. 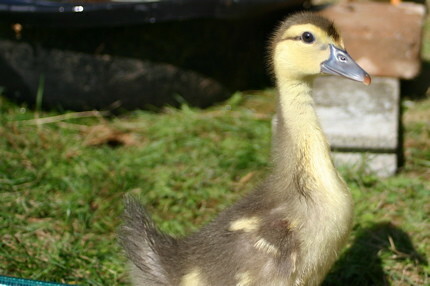 Lastly, O’Malley wanted you to see what he looked like when he was a cute little baby duckling. He was so adorable as a baby that we dressed him up as a princess for Halloween. It was only later that we realized he was a boy, but he’s very secure in his ducky masculinity, so he didn’t mind at all. 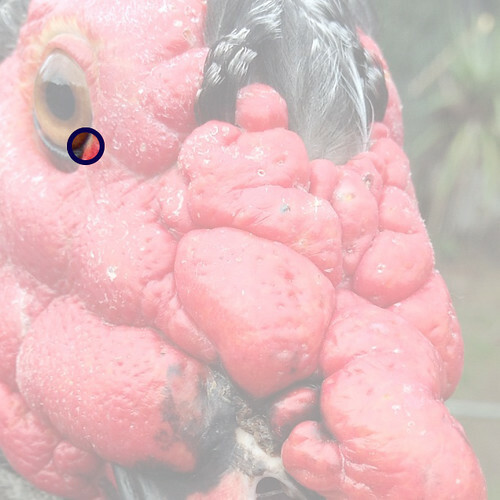 We hope this information about caruncles has helped you see just how beautiful muscovy ducks can be.